Last days. There are a lot of last days coming up for my family and I. But yesterday was my last day of work. The last day I commuted into Manhattan. The last day I needed to catch the bus. The last day I will gaze out my office window at the Chrysler building. Normally last days of work are filled with excitement about the impending freedom. At least in my logical mind, that's how it should be. Maybe I'm too sentimental but this last day filled me with anxiety, shortness of breath and minor panic attacks. The finality of this move was hitting me. It was hard to catch my breath as I wrote my farewell email. And the knot in my stomach never seemed to loosen as the day went on. Leaving my tight knit group of co workers was sad and it didn't dawn on me that it would be so hard to say goodbye. These are the people you share you life with, and now I'm leaving them and the part of my job I did love. I hope that staying in touch won't just be words we say to each other as I past through those glass doors. But life always has a way to turning good intentions into unintentional lies. Whether we do or not, I'm in dire need of some comfort. For some it's a glass of wine, but for me, it's dessert. So on this first day of my new life, I've decided to eat my feelings for a little bit of comfort. And what's more comforting that donuts? 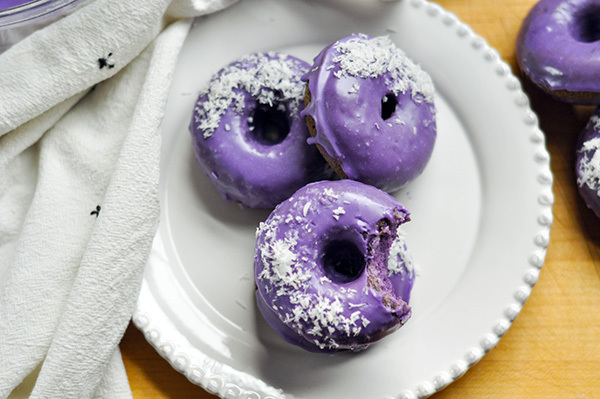 Well, for me, Ube donuts with a Coconut Glaze.